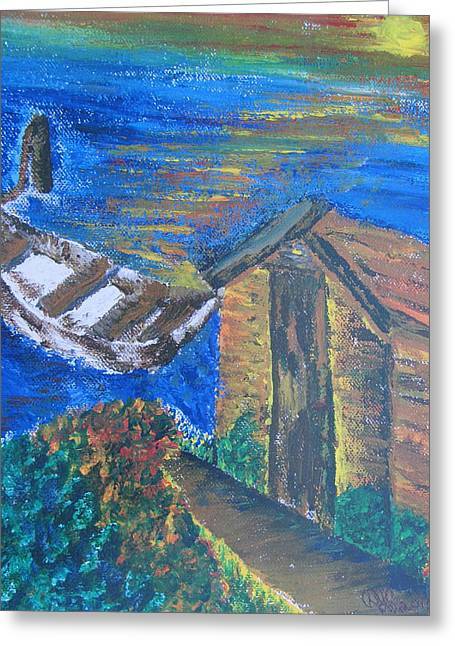 From Sea To Sun is a painting by Debbie Nester which was uploaded on August 23rd, 2013. I painted this Acrylic Canvas Painting in Honor of the Watermen on the Eastern Shore who, for centuries effectively worked hard on the "working boats" to get the Oyster, Clams, Shrimp, Crab, Lobster and variety of Fish to help feed people. 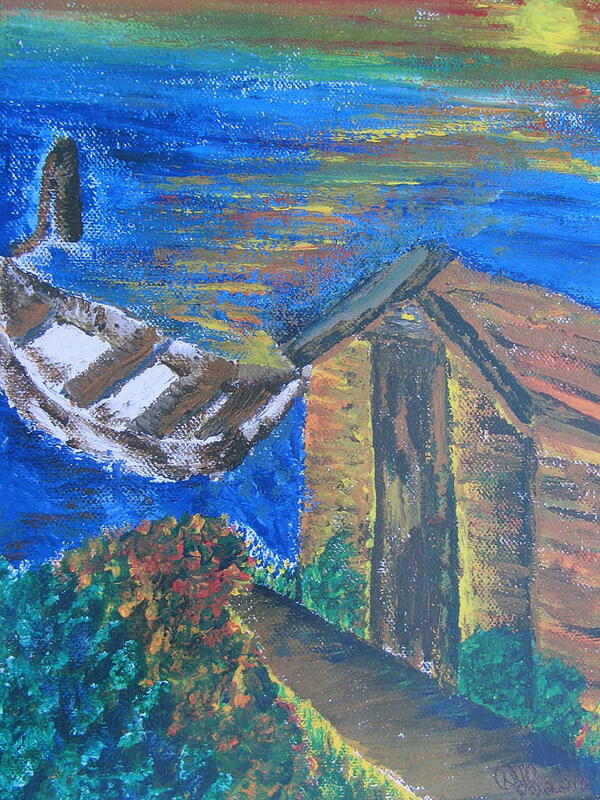 I painted the boat as shown because for Centuries the Watermen did such hard work; thus, the very old looking boat. The buildng represents the Watermen's Shanty, the places along the shore where they periodically resides decades ago and which can be seen in at least one Museum along the Eastern SHore. A print of this Fine Art piece is in a Museum, a gift from me, on the Eastern Shore. This Acrlyic Canvas Painting has optical illusions in it - the longer you focus, the images will become visual. Thank you Jan! I just uploaded some new Holiday Season images too! 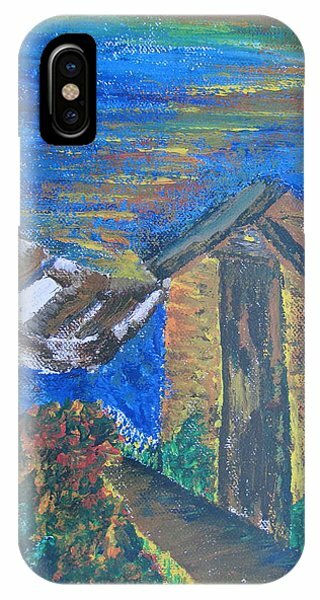 The style reminds me of Van Gogh. Thank you! Stare at it for a while and you'll see the optical illusions in it! 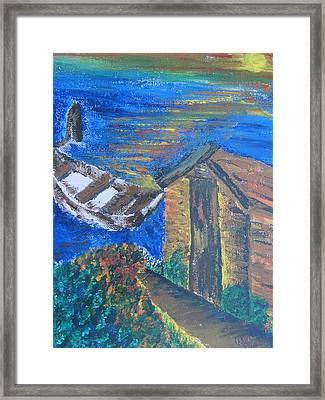 Reposted in the right orientation and colors like in the Original Acrylic Canvas Painting of "Watermen's Boat and Shanty on the Shore" I painted in honor of the Watermen on the Eastern Shore. I gave Museum a Print of the original. I have the Original, also available for purchase. This is from a photograph of the Original Acrylic Watercolor Painting. Remember, if you are on a boat, drive safely, being aware of your surroundings to avoid disaster by the one who isn't aware. Have a safe and beautiful day, and dream on! Today, the Watermen's Boat is a beautiful Sail, larger, like the Skipjack Nathan of Dorchester. Some Skipjacks are still working boats; however, Nathan is available on certain dates for tours. Born on the Fourth of July, Nathan of Dorchester, I was informed, gives out free sails on it's birthday. Please see my Paintings of the Sailboat, a large "Ship" as it is deemed, of the Skipjack Nathan of Dorchester - the one on the Oyster Shell and the one with the name of the skipjack as the title. Shipjacks are simulat to Schooners. Also see my drawing of "Brilliant," the WWII Schooner." Have a wonderful Sail day! 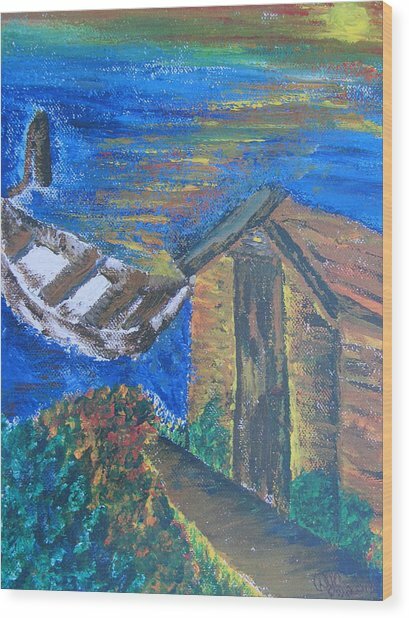 Here's a poem I just wrote to express this Acrylic Canvas Painting: Sun reflecting - on the shore - door projecting - hidden keys -- dock extending - flower bed - never ending. This Fine Art Acrylic Canvas Painting would make a great Halloween Ghost Boat-House Painting to display for Halloween! The colors are bright, such as the orange. I found that putting my computer screen back some shows the real color, rather than the duller look if the screen is straight upward. The cost of the Original is listed wrong here. Reposted without the date. 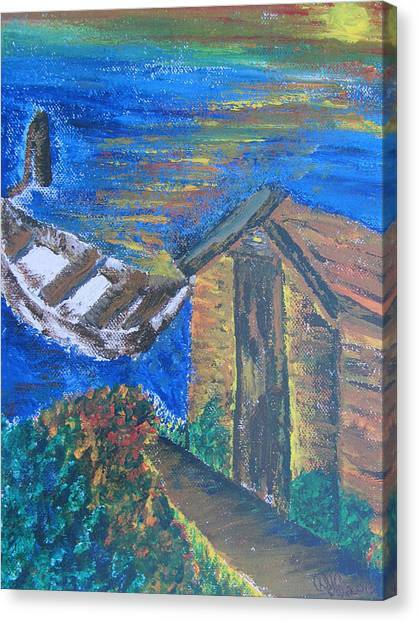 Optical illusions are visible the longer you focus on this Acrylic Canvas Fine Art Painting.